Commercial support for car racing is not a new phenomena, and almost from the word go, the trade were heavily involved, either directly through manufacturers entering their own cars, or fuel, oil, tyre and associated companies supporting events or individuals by the supply of their product. A lot of these companies also provided bonus payments if records or wins were achieved using those products. Newspapers were another prime source of publicity and sponsorship as well, right from the earliest days of competition, many holding events under their title with suitably impressive trophies. In the 60s and beyond, the trade and newspapers largely bowed out to be replaced by non-related companies, including tobacco, airlines and major finance house such as Lombard, UDT and Yeoman Credit. Oh, that all brings back memories. Tethered cars in the late 1940s and early 50s very much imitated the full sized racing of the period with support from major manufacturers, the trade and newspapers. 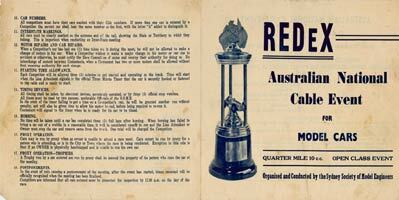 Jaguar, Austin and MG car companies all donated trophies, as did the Daily Sketch and Daily Despatch. Esso and Shell both supplied fuel for model engines, and Esso claimed to have sponsored events where competitors used their fuel exclusively. None of these though took such an active interest as the Wayne V Myers Co of Chiswick High Road, with their trade name REDeX upper cylinder lubricant, a staple of every garage forecourt for years at a penny a shot. 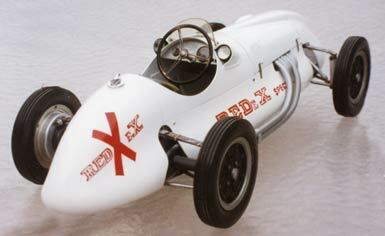 REDeX was already active in sponsoring full sized car, motorcycle and hydroplane racing, some of the trophies and events surviving to the present day. 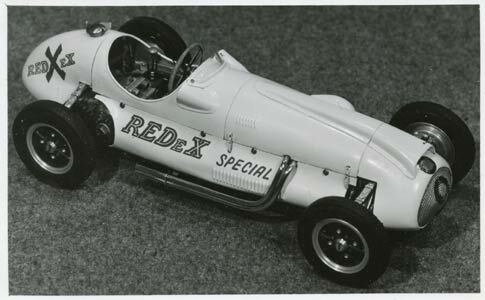 The first real mention of the involvement of the company with tethered cars was not until 1952 however, when articles appeared in Model Maker describing the model versions they had commissioned of their full sized REDeX Special, raced by Mike Hawthorn. As related previously, Arthur Weaver, a very experienced racer in his own right as well as a highly gifted prototype model builder was initially asked to build two of these cars for Company agents around the world, actually a Formula II Cooper Bristol. With the likelihood of more being ordered, Arthur went into what he described in Model Maker in April 1953 as ‘small scale mass production’, building two of the cars in the all white REDeX livery and one for himself in plain British Racing Green. These were of completely scale external appearance with suspension, springs, wheels and tyres as on the original but entirely functional chassis underneath and powered by an ETA 29 glow engine driving through a bevel gearbox. In October 1952 Model Maker had featured the version built by Henri Baigent for the company. This was a one off, intended as a model test bed for their researches into the possibilities of the application of REDeX to the miniature petrol and compression ignition engines. The company had been carrying out tests on small engines using fuels they had blended in conjunction with one of Britain’s most successful international competitors, Jim Dean. Again the model was of scale external appearance, but this time with an even more functional chassis and a spur gear mounted ETA 29. In the article, the company stated that they intended to produce a brochure when the British team, using REDeX in Italy return. At Monza, the British won the team prize with Alec Snelling winning 1.5cc and 10cc and Jim Dean winning the 5cc class and second in 10s. The brochure claimed that the team used REDeX in a special blend of fuel and also for bore soaking and general lubrication. Quoted results included FTD in 5s and 10s on July 6th at Edmonton 92.97 by Jim Dean and 126.40 by Joe Shelton with Cyril Catchpole 2nd in the 10s at 123.96, all on REDeX fuel, the cars, not the competitors that is. To back up these claims, it outlined a test on a small diesel with REDeX fuel that saw bhp rise by 3% and 400 revs gained. For diesels the mix recommended was Ether 30%, Gas oil 40%, Mineral oil 10%, REDeX 20% The petrol motors had the even more toxic mix of Methane 40%, Benzine 7% Castor oil 18½ % REDeX 4% and Methanol 30 ½%. 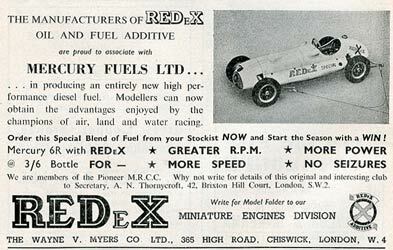 Early in 1953 an advert appeared announcing an association with Mercury Fuels ‘producing an entirely new diesel fuel’. It claimed greater rpm, more power, more speed and no seizures so ‘modellers could now obtain the advantages enjoyed by the champions of air, land and water racing’. All this for just 3/6 a bottle? 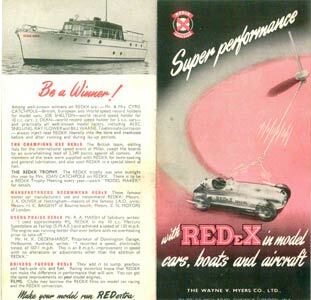 According to other contemporary adverts, the use of REDeX was also endorsed as manufacturers by J A Oliver, Henri Baigent and ZN Motors (Paul Zere), amongst others. In their brochure, Myers advertised a Miniature Engines Division while the Company’s sales manager Mr W J Holloway was noted as a keen ‘modellist’. 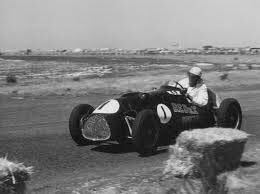 In fact Bill Holloway was somewhat more than that, regularly running a Harry Howlett inspired Oliver Alfa Romeo. One wonders if it was his involvement with tethered cars that engendered the Company’s interest in the first place? Holloway (and the Company) were members of the Pioneer Club, now based at Edmonton where the Baigent REDeX Special appeared on a regular basis. Of the Baigent car, nothing further is known, whilst one of the Weaver cars went to Australia and a second was featured as part of the ‘Spindizzy collection’, both are known to have survived to the present day, although the whereabouts of the one in the US is unknown. Arthur’s own car, less engine, was in the Stratford on Avon Motor Museum until it was stolen in 1990. It has since reappeared and been photographed, but as yet we cannot trace where and by whom. By a remarkable coincidence, just as this article was being prepared for publication, we received details and a series of photos of a third Weaver Cooper Bristol in full REDeX Special livery, hitherto unknown and unrecorded. This would indicate that Arthur had actually built at least four of these cars. 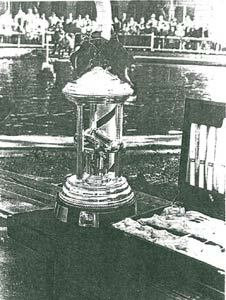 The Myers Company did donate a trophy for competition in the UK from 1952, although details are very sparse as race reports and results were becoming much less frequent by this time. So far, we do know that Joan Catchpole won it outright in 1952 and that in 1954 it was scheduled for Cleethorpes in September and Sunderland in August 1955. 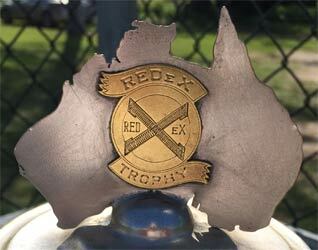 Thanks to Scott Clydesdale we do have more information surrounding the companion trophy in Australia. 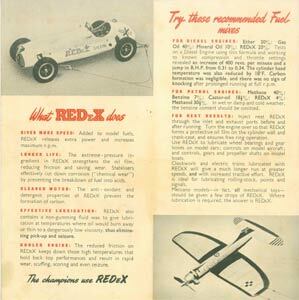 In the 1950s, REDEX Products A/SIA Pty Ltd sponsored a National event to be held at the Ashfield track of the Sydney Society of Model Engineers. This was probably as an adjunct to their sponsorship of a young Jack Brabham in another Cooper Bristol ‘REDeX Special’. This version though was not in the all white livery, but black with minimal reference to the Company. Unfortunately the Australian authorities did not allow commercial advertising on cars so it was short lived. The tethered car race was for open class 10cc cars run over three heats of 500yards. The winner would receive a replica of the full sized REDeX perpetual trophy and a canteen of cutlery, with other prizes being provided by the club. A proviso was that the major trophy would be presented to any competitor who won three years in succession. The rules were quite specific as the brochure for the event outlines. 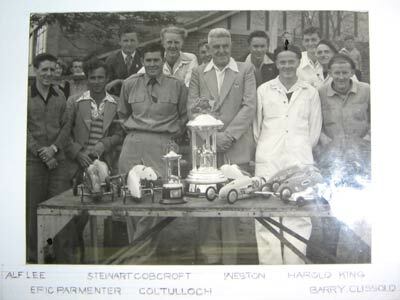 Scott has very kindly sent us a photo of the original trophy and replica with a group of competitors that include Alf Lee, Eric Parmenter, Stewart Cobcroft, Col Tulloch and Eric King, an impressive line up of influential Australian tethered cars racers of the period. 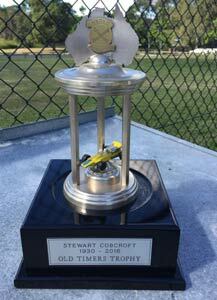 It is not now known how long this trophy was competed for, but at some stage it was won by Stewart Cobcroft as the replica was bequeathed, by his estate, to Tony Peacock, who in turn has donated it to the Queensland Club as a perpetual memorial trophy. It is possible that the original trophy still exists somewhere, but thanks to Scott Clydesdale we have an excellent background to the 'Australian' version. Begs the question as to what happened to the British one although we now have a better understanding of the involvement and legacy of REDeX? REDeX continued to support the British Team and events in this country as photos from club and international events confirm. 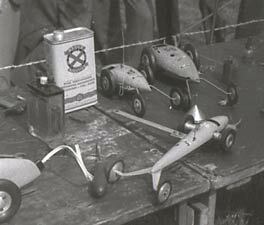 Pit shots from the 1954 European Championships at Woodside show cans of the product prominently displayed. The company also had a film made on model car racing that was available for clubs to borrow, but by the mid 1950s, tethered car clubs and racing in Britain was on the wane and no further mention is to be found of REDeX in relation to the sport. Original images thanks to Scott Clydesdale, Justin Cookson, Miles Patience and Ron Reiter.